There is an old saying, “One man’s waste is another man’s treasure,” and this could not be truer for the next group of invertebrates, the collectors. There are two types of collectors, gatherers and filterers, both equally important. They eat Fine Particulate Organic Matter (FPOM), which can be the particles created by the shredders. The difference between the two types of collectors is how they acquire FPOM. Filtering collectors use specialized mouth parts to capture the FPOM food. Whether it uses a fan shaped mouth part, a feeding net, or another structure, the filtering collector insect positions the device or structure so that it collects the FPOM suspended in the water. Gathering collectors eat FPOM that is no longer suspended in the water column and is on the rocks or other surfaces under the water. The mayfly family Baetidae is well represented in this group of feeders, and is commonly found in large river systems where FPOM is abundant. 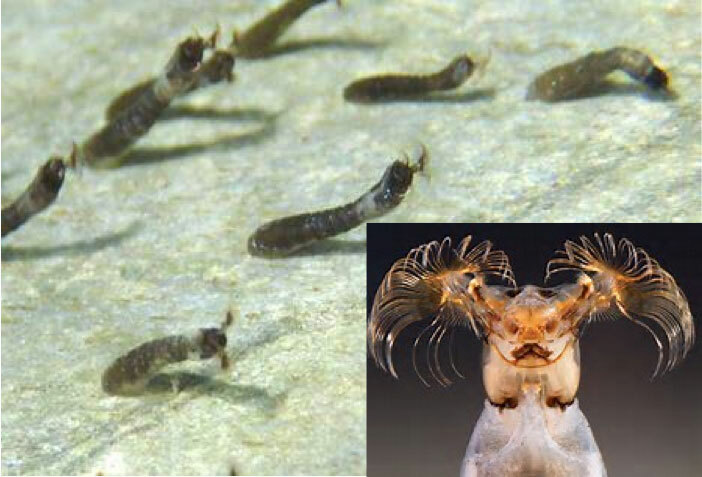 Figure 20: Filtering collectors use specialized mouth parts, such as the fans on the heads of these black fly larvae, to capture fine particulate organic matter. Larger photo by Joe Giersh. Inset picture shows a close up of the fans.